Sonia Robbins, plastic surgeon, gives us more insight into the shoah. Hi, what to say? 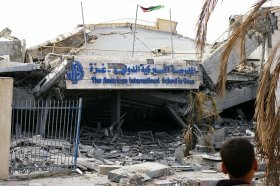 The aftermath of the massacre leaves destroyed families and buildings, no sign of cement coming in, Rafah still intermittently closed, many patients transferred to Egypt and lost into black hole of bureaucracy and families cannot trace. Medical staff and people still shell shocked although cars and people on the streets again but all people have the memories of the events of 20 days bombardment, charred bodies and probably no family is intact. We visited a number of homes where people, often children, sit with legs in plaster, dressings on multiple wounds - not sure what happened and what is going to happen as the medical services probably did break under the strain and now only with all the visitors is there ongoing care. Medical staff here need time off but still sit in clinics trying to cope. Money will no doubt pour into the system now but unless there is some justice over the use of unconventional weapons on a civilian population. In almost every street there are bits of phosphorus mixture that kids play with to make it ignite - 20 days later in some cases. That also needs clearing up safely particularly as rain water or the heat of summer could reignite these remnants. Children are already getting fingers and faces burnt as they play with remnants in the streets. Reports will come out but all effort must be made to bring some justice to the Palestinian people. Phosphorus and possible other materials used may also have a later carcinogenic effect. I am OK and being accompanied by Greek and UK colleagues some of the time which is good when seeing and hearing about these events. Such weapons should not be produced for any use. There are also very disturbing reports of executions by Israeli ground personnel. No wonder Israel has done its best to keep all journalists and foreigners out as long as they could and for most of the 'war'. It is still making it very difficult for entry with Egyptian bureaucratic help even to deciding that a psychiatrist was not 'medical enough - not needed' in 'the situation' and therefore not allowed in. Knowing when to leave will be difficult as it will take many years and perhaps never for all the physical scars and rebuilding to be done as well as the unseen psychological ones. But much will be healed and helped if there is some justice here. Without that the physical scars on the bodies and buildings here may be patched up but the deeper psychological ones will remain without the healing salve of some restorative justice. The picture is as it says - the American School in Gaza targeted by Israel - probably with munitions from USA. What an education we are giving here.